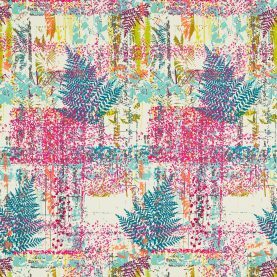 Ferns from far-away places are strewn randomly in ombre hues of pink, coral and lemon on a natural linen ground. The individual fronds were collected by Clarissa on her travels, from Caribbean beaches, Wiltshire gardens and shady Scottish gullies. This cushion was designed to coordinate with the Filix bed linen but is equally lovely on its own.